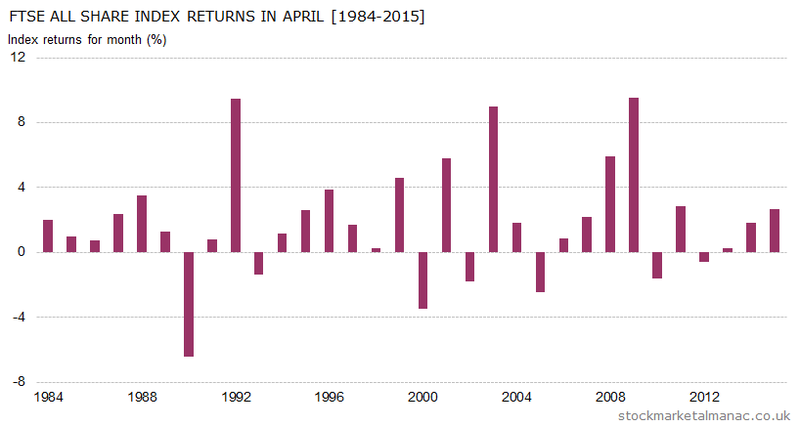 Historically, April has been one of the best months for equities. Since 1970 the average return for the FTSE All-Share Index in the month has been 2.6%, with positive returns seen in 83% of Aprils in the last 47 years. This is the best record, by quite a margin, for any month in the year. And the strong performance has continued in recent years. 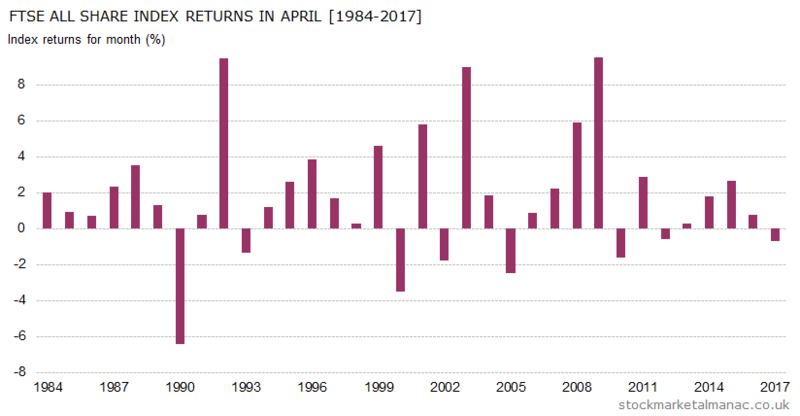 Since 2000 the average month return for the index has been 2.0% and, as can be seen in the accompanying chart, the market has only fallen in April in five years since 2000. It’s Easter on the 16th so the LSE will be closed on the 14th (Good Friday) and 17th (Easter Monday). A famous anomaly in stock markets is that prices tend to be strong on the day preceding and the day following a holiday. This effect is strongest in the year around the Easter holiday. April – one of the most exciting months for investors! Five years ago April was the strongest month for the stock market in the year, but it now ranks second behind December. The two months have been switching first and second places for quite a few years now. For the last few years it has been December, but April is not far behind. Interestingly, this characteristic is not unique to the UK market; a study of 70 markets worldwide found that the strongest months for shares were (in descending order) December, January and April. On average the market rises 1.8% in this month; and the probability of a positive return in the month is 71%. 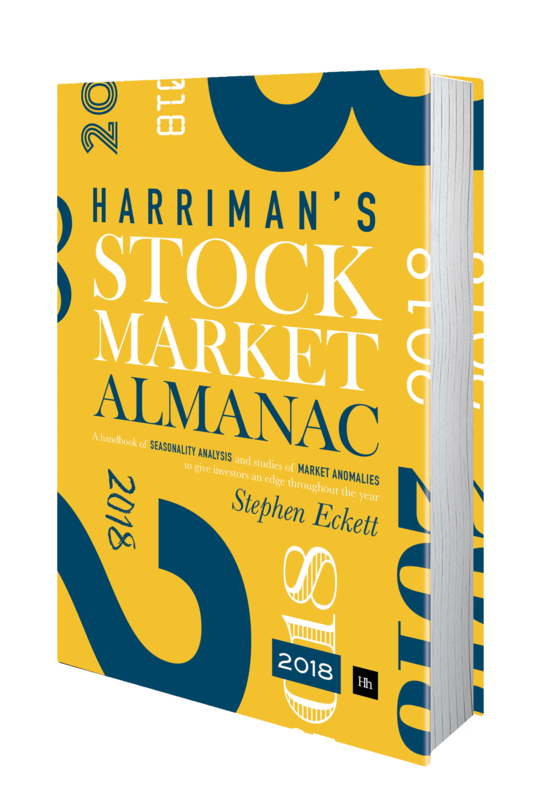 Since 2003 the market has only fallen three times in April; although this doesn’t match the earlier performance: from 1971 the market rose in April every year for 15 years – a recent record for any month. As can be seen in the chart, the strength of the market in April has been fairly constant since 1984 apart from in a few years. This is the strongest month for the FTSE 100 relative to the S&P 500 (in sterling terms), the former out-performs the latter by an average of 1.3 percentage points in April (in 2015 the FTSE 100 out-performed the US index by 5.1 percentage points). April also often sees strong performances by sterling against the dollar and oil. The seasonality significance of April is that it the last month in the strong part of the six-month cycle (November-April), that is a feature of the Sell in May Effect (called the Halloween Effect in the US). Therefore investors may be reducing their exposure to equities ahead of May. In the diary this month we have US Nonfarm payroll on the 1st, MPC interest rate announcement on the 6th, and the two-day FOMC meeting start on the 26th. Anniversary-wise, 40 years ago this month in 1976 the first Apple computer, the Apple I, was released. In the same month James Callaghan was elected prime minister and long-end gilt yields were 15%. April is one of the most interesting months for investors. Let’s start with the fact that for the past decades the two stand-out strong months for the market have been April and December – the two have been switching back and forth as the single strongest month. For the last few years it has been December, but April is not far behind. Incidentally, this characteristic is not unique to the UK market; a study of 70 markets worldwide found that the strongest months for shares were (in descending order) December, January and April. On average the stock market rises 1.8% in this month; and the probability of a positive return in the month is 70%. As can be seen in the accompanying chart, since 2003 the market has only fallen three times in April (although this doesn’t match the earlier performance: from 1971 the market rose in April every year for 15 years – a recent record for any month). The great seasonality significance of April is that it the last month in the strong part of the six-month cycle (November-April); and therefore investors may be reducing their exposure to equities ahead of May. Although over the last few decades the US market has greatly out-performed the UK, the FTSE 100 Index has had a tendency to out-perform the S&P 500 Index in certain months. April is one of those months; in fact, this month is the strongest month for the FTSE 100 relative to the S&P 500 – the former out-performs the latter by an average of 1.2 percentage points in April. This month is very quiet for company announcement: only five FTSE 100 companies and 11 FTSE 250 companies announce interims or finals this month. On the economics front, there will be the US Nonfarm payroll report on the 2nd, the MPC interest rate announcement on the 9th and the FOMC meetings starts the 28th. Easter occurs early this year falling on the 5th; with the LSE closed on the 3rd and 6th. Apart from the days off, is Easter of interest to investors? Well, it could be. 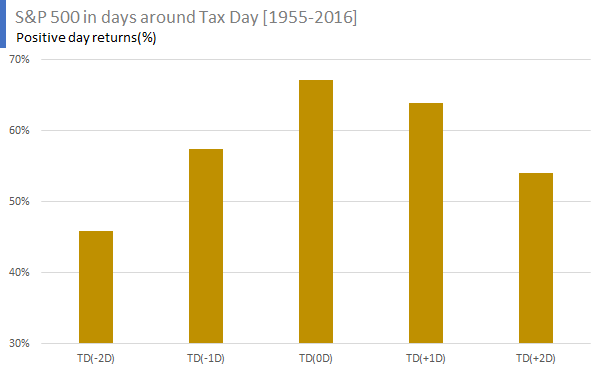 Academic studies have shown that markets tend to be strong on the day immediately before a holiday and the day following a holiday – and this effect is strongest around Easter. The following chart plots the average performance of the FTSE 100 Index during May since 1984 (more info on this type of chart). 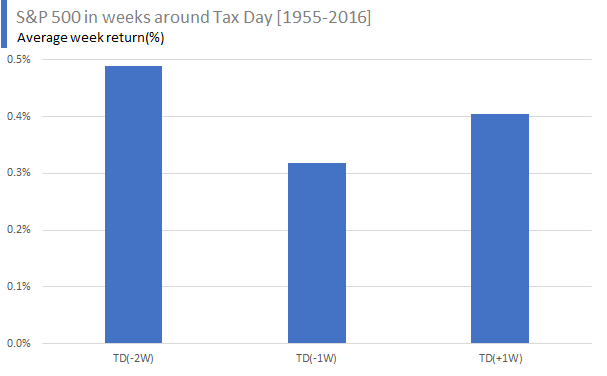 As can be seen, historically the market has on average generally risen very gently for the first two weeks of the month and then sold off in the second half to finish down on the month. 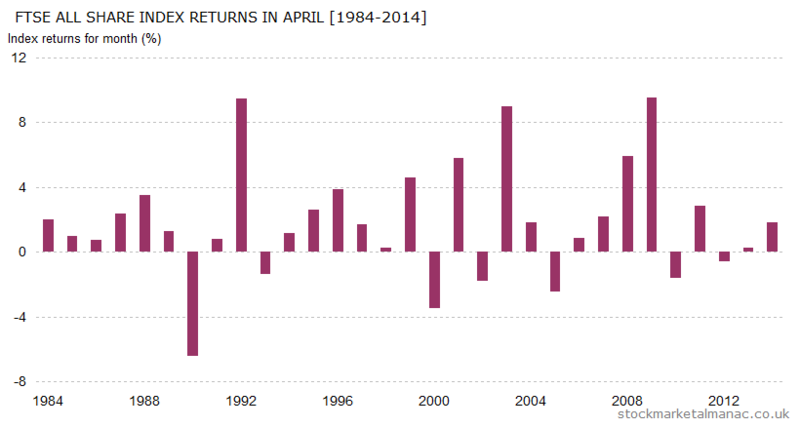 The following chart shows the average performance of the market in April (1984-2013) and overlays the actual performance in April 2014. 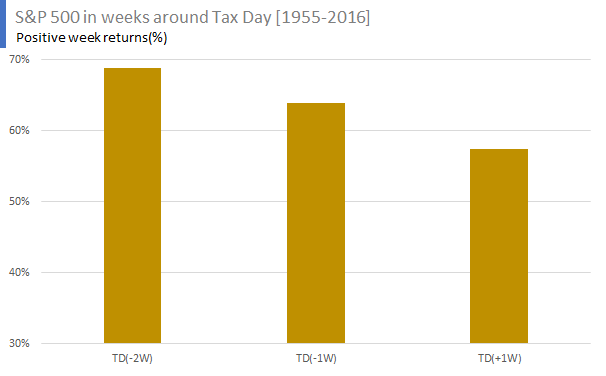 In April 2014 the market traded in-line with the historic pattern in the first and final two weeks of the month, but was abnormally weak in the second week. Tomorow will be the last trading day (LTD) of April. As explained in the 2014 edition of the Almanac the LTDs of months used to be stronger than average, but in recent years they have been weak. 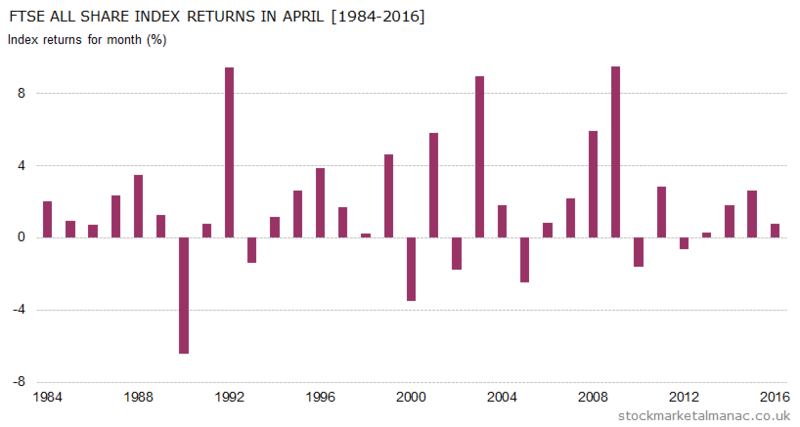 Since 1984 the index average return on the April LTD has been 0.17%. 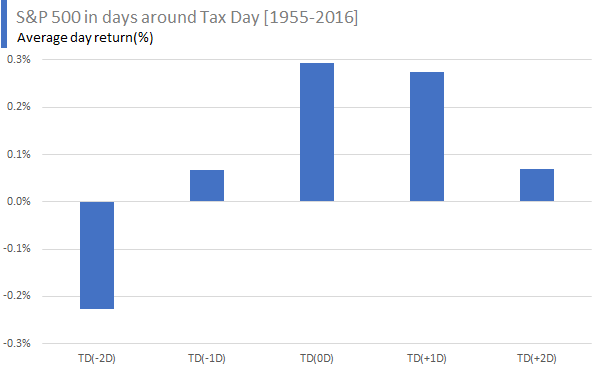 From 2000 the index average return on this day has been weaker at 0.09%. 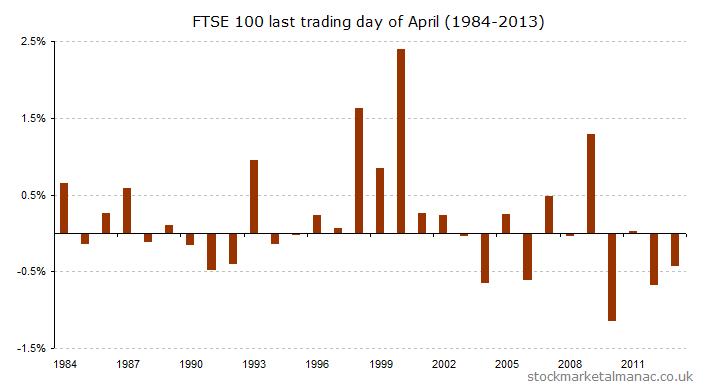 The following chart plots the average performance of the FTSE 100 Index during April since 1984 (more info on this type of chart). As can be seen, historically the market has on average generally risen steadily throughout the whole month of April, ending at the high for the month. The following chart shows the average performance of the market in March (1984-2013) and overlays the actual performance in March 2014. In March 2014 the big difference from the average March was the weakness in share prices in the first two weeks of the month.